Liverpool manager Rafael Benitez wants to field his reserve team in the Football League. Benitez believes the current reserves set-up in football is not beneficial to the youngsters and wants changes. He said: "I would like to see reserve teams of the big clubs like ourselves playing in the Football League. Why not if they have enough quality? "Our young players may have the quality but not the experience for the first team. They are only on the bench." He added: "That will bridge the gap between the youngsters and the first team. "If you do not give young players the chance to play competitive football and to learn things, things become impossible." Benitez managed the second string of Real Madrid in Spain where the B teams of the Bernabeu club and others are allowed to play in the lower echelons of the country's league football. Chelsea manager Jose Mourinho has also stated he would like to put a side out in the Football League. 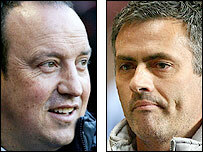 "It is clear that the reserve system doesn't work, the reserve league is nothing," said Benitez. "You can see youngsters playing just 18 games a season, that is nothing. Certainly not enough for the development of these players. "It is something that we can improve in this country. Or if we do not change we will find other solutions, sending youngsters out on loan like I have done recently. "I do not want to see reserve teams with four or five senior men playing without passion. These games are for young players." He added: "I used to be the manager of Castilla, Real Madrid's reserve side, and I had players who were 18, 19 years old playing in the Spanish second division championship. "They were playing against men. They were winning and we finished sixth and fourth. The question is, what improves the quality of the players? "And I am not sure about them playing in League Two, either; they need really to be playing against good players, then they will learn more." Former Liverpool striker Michael Robinson, who is now a presenter on Spanish television as well as a part-owner in lower league club Cadiz in the country, is against the idea. In Spain, the B teams cannot be promoted and certain rules govern which players a side can use as a player named in the first-team squad of a major club cannot then play for the reserve team. "I think it's an awful idea, and another one of the great evidences where the rich get rich and poor get poorer," he said. "The fact that you can't go up and play in the same league as the first team creates all sorts of problems for the other teams. "How can you play in a competition under fair circumstances where no matter how well Real Madrid do, they cannot go up? So that affects their way of thinking. "Here in Spain you get circumstances whereby if big clubs want to take players from their second team or third teams, that means that particular team, when it plays in their respective leagues, become an easier opponent for the team they are playing." Peterborough director of football Barry Fry said Rafael Benitez's proposal "would never happen in a million years". "The Football League is a thriving, 72-club competitive competition which is one of the best supported in the world - 16 million people watch it every season. "No-one would want to watch the reserve teams of any club - I don't care if they're Real Madrid, Juventus or Fray Bentos! "If Rafa Benitez wants his young players to get competitive games then all he has to do is loan them out to clubs like us." Gillingham chairman Paul Scally believes the current loan system is more than adequate - because young players from Premiership clubs often struggle in the Football League. "I can understand the rationale in loaning them out to Football League clubs, which is available to them now, but I don't envisage the situation of a nursery club system," he said. "That's not going to happen in our lifetime. "It's insulting to suggest that a bunch of Liverpool kids could hack it as their own club in the Football League. "The Football League has got far greater qualities than that." Mansfield manager Billy Dearden said English football would be scarred by the idea. "It's a silly idea - out of order really. We are getting knocked about by people who are not from our football world." Fry added: "Clubs like Peterborough are part of the community, as are clubs like Rochdale, Bury, Barnet, all these other clubs, and their supporters are only interested in supporting them," he said. "They're not remotely interested in the Liverpools, Arsenals, Manchester Uniteds and Chelseas. "They support their local clubs and you will never be able to take that out of the towns and the cities in this country."